It’s strawberry season in Maine! This is something I look forward to every year. Bright red, juicy berries……yum! The use of strawberries and the strawberry plant dates back over 2000 years. It is often described as a luxury item enjoyed by royalty. American Indians prepared infusions of the plant leaves as treatment for stomach ailments. The French philosopher Bernard de Fontenelle who died at the age of 100, attributed his longevity to strawberries. So, just what are some of the health benefits of strawberries? Strawberries contain lots of antioxidants, which may decrease the risk of chronic disease. They are an excellent source of fiber and vitamins including vitamin C, K, B1, B6 and folic acid. Strawberries have been shown to inhibit COX enzymes in vitro which inhibits the inflammatory process. Preliminary studies have also shown that eating strawberries can possibly increase anti-cancer activity on cancer cells of the breast, skin, colon and prostate. 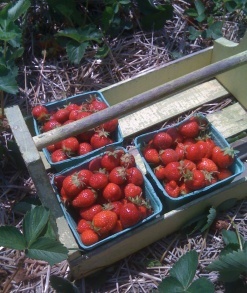 Lots of good reasons to support your local farmer and pick a quart of strawberries. Here is a recipe for a delicious strawberry smoothie. Mix all ingredients in a blender until smooth and creamy. You can also add other fruit like bananas. Enjoy! !